Earlier this year we described the great advances that have been made in automated breast ultrasound (ABUS), a technique where the transducer is moved across the breast under automated control rather than manually. One of the major benefits of ABUS is that multiple 2D ultrasound images can be combined to yield a 3D volumetric representation of the breast. While we may think this technology is a recent development, its history stretches back over 60 years. In her book Naked to the Bone, Bettyann Kevles describes the work of early pioneers who, building on the applications of sonar during World War II, set about finding medical applications for high-frequency ultrasound. One of these was an eccentric Englishman called John Wild who emigrated to Minnesota after the war. In 1951 he described the acoustic characteristics of two breast tumours, one benign and the other malignant, using a hand-held — and hand-made — sonography device. Wild then developed an automated system in which the woman lay on top of a water bath with her breasts submerged in the bath. An ultrasound transducer was moved rapidly in a semi-circular reciprocating motion through the water under the control of a hydraulic motor. With this system he successfully characterised 12 out of 12 malignancies and 9 benign tumours. The next major development came in the 1960s from a group of researchers at the Ultrasonics Institute in Australia led by George Kossof and Jack Jellins (see photo at right). The patient lay on the bed and a water bath was lowered onto her breasts. 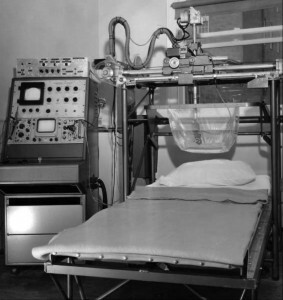 The ultrasound transducer, located within the bath, was then moved under automated control on a set of rails. 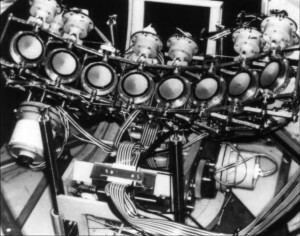 In the 1970s the Australians introduced another system called the Octoson (see photo at left) that used eight separate transducers located beneath the bed with the woman now lying face down, similar to the system developed by Wild twenty years earlier. A noteworthy pioneer from this era was Elizabeth Kelly-Fry in Indiana whose innovative designs were commercialised by a company called Labsonics. In 2012 there are at least six companies that are selling, or are about to sell, commercial ABUS systems. Three of these companies — U-Systems, Siemens and SonoCiné — have the woman lying supine, while the other three companies — Ultrasonix, Delphinus and TechniScan — have her lying prone. Time will tell whether one of these two or perhaps even a third orientation proves to be the most successful.